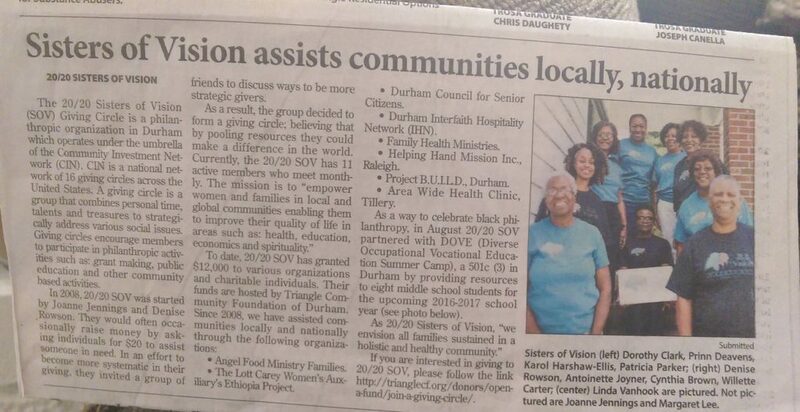 The 20/20 Sisters of Vision (SOV) Giving Circle is a philanthropic organization in Durham which operates under the umbrella of the Community Investment Network (CIN). CIN is a national network of 16 giving circles across the United States. A giving circle is a group that combines personal time, talents and treasures to strategically address various social issues. Giving circles encourage members to participate in philanthropic activities such as: grant making, public education and other community based activities. In 2008, 20/20 SOV was started by Joanne Jennings and Denise Rowson. They would often occasionally raise money by asking individuals for $20 to assist someone in need. In an effort to become more systematic in their giving, they invited a group of friends to discuss ways to be more strategic givers. As a result, the group decided to form a giving circle; believing that by pooling resources they could make a difference in the world. Currently, the 20/20 SOV has 11 active members who meet monthly. The mission is to “empower women and families in local and global communities enabling them to improve their quality of life in areas such as: health, education, economics and spirituality”. The Lott Carey Women’s Auxiliary’s Ethiopia Project. Durham Council for Senior Citizens. Durham Interfaith Hospitality Network (IHN). Helping Hand Mission Inc., Raleigh. Area Wide Health Clinic, Tillery. As a way to celebrate black philanthropy, in August 20/20 SOV partnered with DOVE (Diverse Occupational Vocational Education Summer Camp), a 501c (3) in Durham by providing resources to eight middle school students for the upcoming 2016-2017 school year (see photo below). As 20/20 Sisters of Vision, “we envision all families sustained in a holistic and healthy community”.